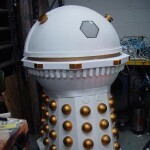 In the Autumn of 2015, The Model Unit were tasked with refurbishing two Dalek related props that had been poorly maintained since their last screen use and intervening years at exhibitions – Davros and The Emperor Dalek. Mike Tucker has granted us exclusive access to the picture collection of his restoration of The Emperor prop and we are pleased to be able to share them with you. 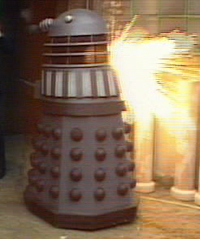 In 1988, the Doctor Who production team were looking to bring back the Daleks for the 25th season of the show. 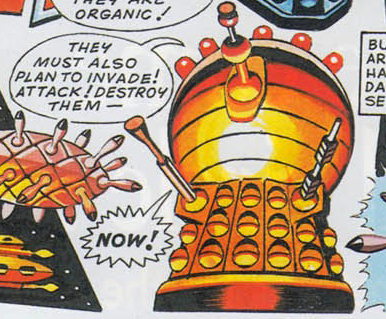 The initial drafts of Ben Aaronovitch’s script didn’t include Davros and instead concentrated on two factions of opposing Daleks. 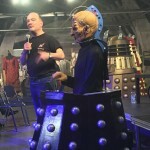 However, at a lunch meeting with Mike Tucker, script editor Andrew Cartmel decided to approach Aaronovitch with a plan to include Davros. 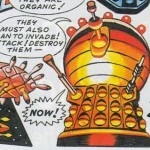 The meeting had kicked around some ideas and Mike had alluded to the 1960’s comic book Dalek Emperor. 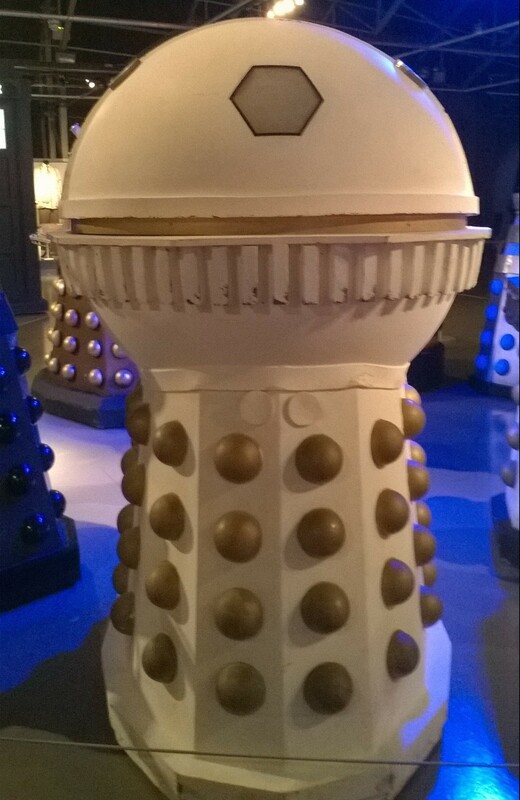 This Dalek had a somewhat cult image, with its huge golden ball-like head on its skirt section. It was fondly remembered although didn’t resemble anything that appeared in the TV series itself. Mike recalled a discussion he had once had at college with costume prop maker Rob Allsopp. Rob had always felt that it would be a great surprise if, one day, the dome of the Emperor could slide back and reveal Davros inside. Mike put Rob’s suggestion forward, Cartmel ran with the idea and Aaronovitch was happy to include it in later revisions of his scripts. 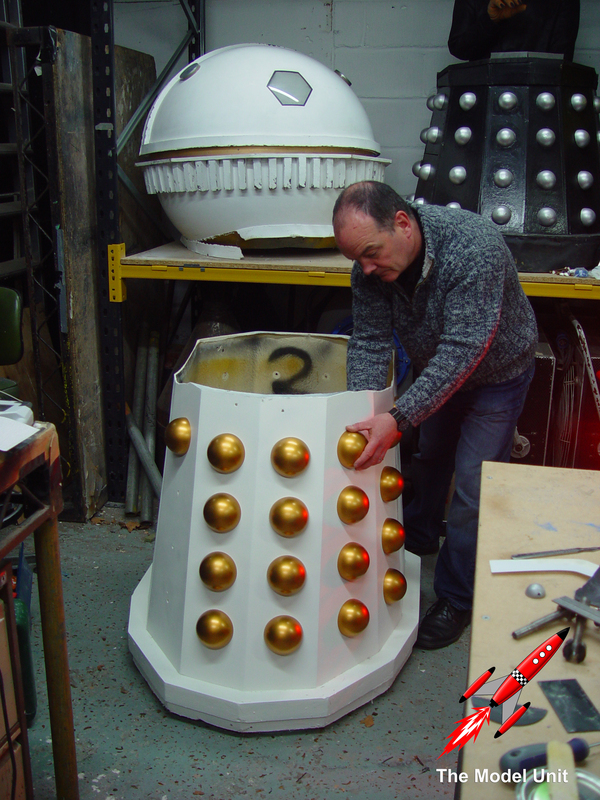 More about Remembrance of the Daleks can found found on our dedicated page here. 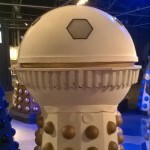 At the Doctor Who Experience prior to refurbishment. 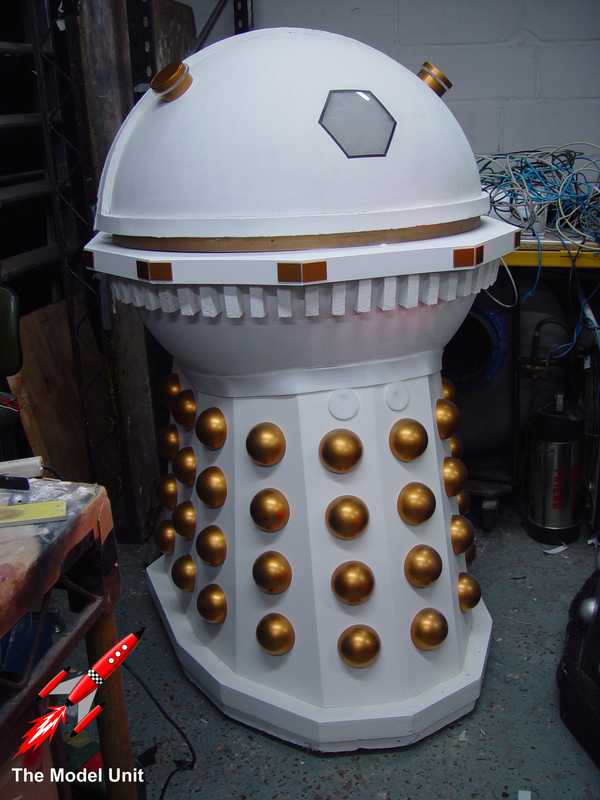 With the ‘classic’ series finishing the year after, The Emperor prop had only been used once onscreen. But it wouldn’t be that last time it was seen. It was sent to various exhibitions including The Space Adventure and MOMI in London, Longleat and the second incarnation of the Blackpool Exhibition. 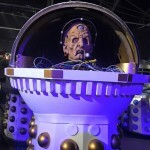 After a few years in storage when the Blackpool exhibition closed it reappeared at The Doctor Who Experience in Cardiff looking very worse for wear. The Emperor and Davros arrive at The Model Unit. Picture – Mike Tucker. The original lights and some of the detailing around the circumference of the dome had broken off due to the prop being lifted into position at the various exhibits. The paintwork was starting to flake away and the hemispheres were looking poor due to constant bashing. 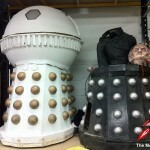 And it was in this state that the prop arrived at The Model Unit along side a very dilapidated Davros prop that was also due to be refurbished. 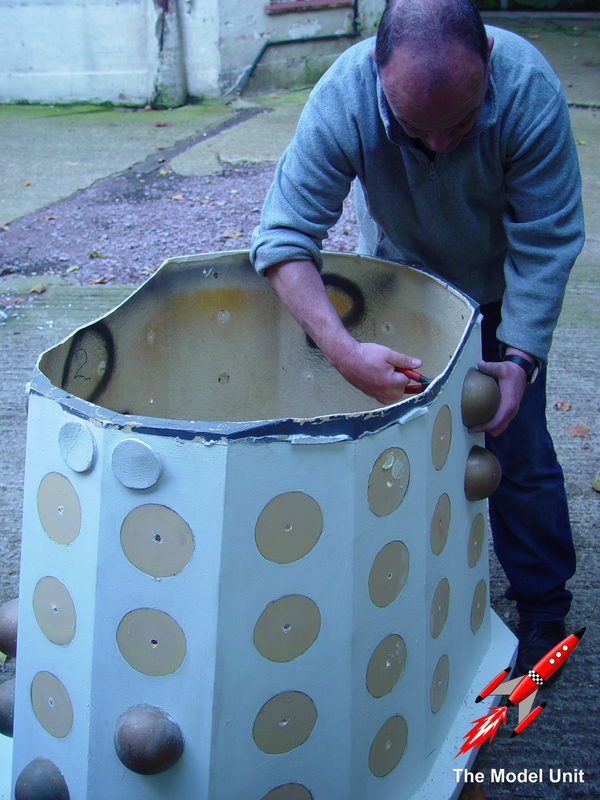 Initially Mike carefully dismantled the prop to assess what needed the most attention and what sections could remain as ‘original’ as possible. With the top section removed a clear view of the skirt section could be afforded. 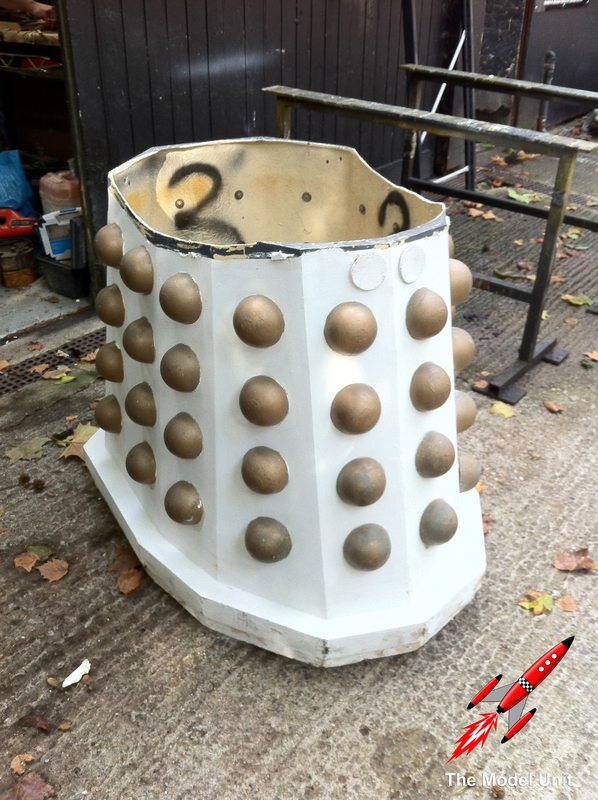 The skirt section originally belonged to Renegade Dalek N5 and remains of its grey paint could still be seen around the upper edges of the skirt. 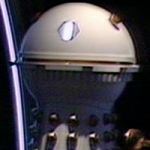 The Renegade Daleks were used only very briefly in the studio taping which occurred at the end of the shoot of Remembrance of the Daleks. Therefore, it was decided that one of them could give up its skirt to become part of the Emperor. 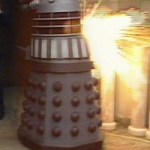 In the location work, Dalek N5 had been used in an SFX shot where it had to appear to be destroyed by the Special Weapons Dalek. 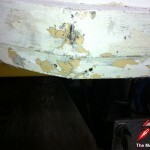 To complete the effect to holes were drilled in the front of the fender. Wires were fed through the holes and the prop was pulled on the detonation of the explosive to give the impression that it was a more powerful impact. These holes would become useful again in studio. 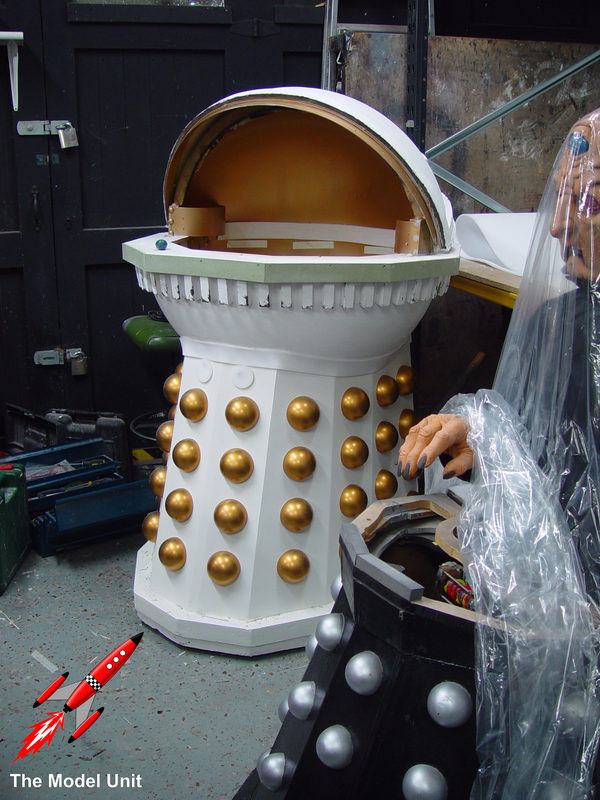 Terry Molloy, being of smaller stature (a necessity of the original Davros chair) and sat up higher in the Emperor prop, couldn’t reach the floor and so had to be pulled into position. The holes remain in the fender and can still be clearly seen. Mike’s pictures allow us a rare view inside the skirt too. 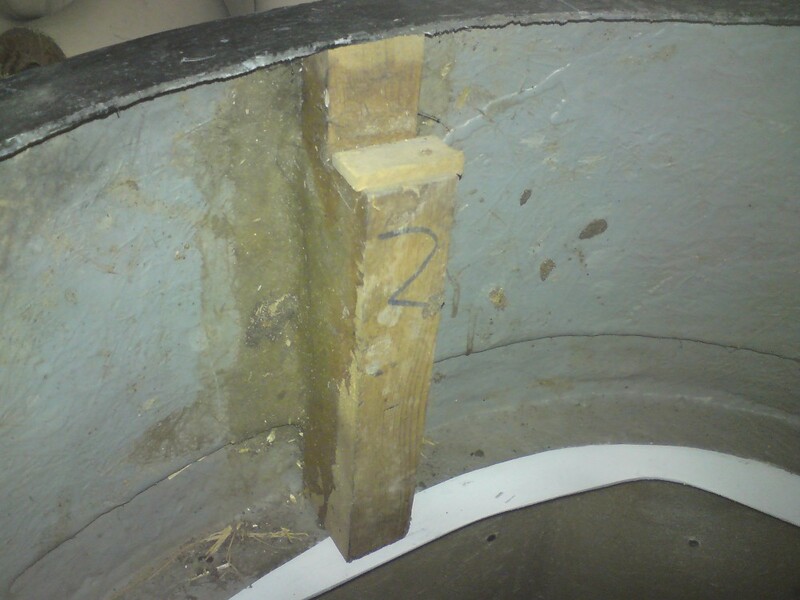 The original seat has been removed but the remains of the protective foam, for the operators knees, can still be seen and the original sprayed ‘2’ also remains. 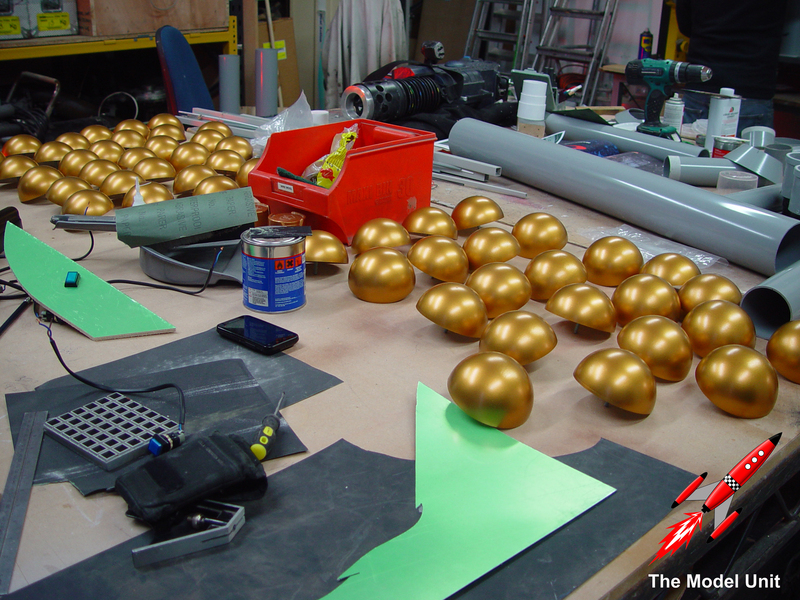 These numbers were sprayed into the various sections of the props so they could be matched up easily. 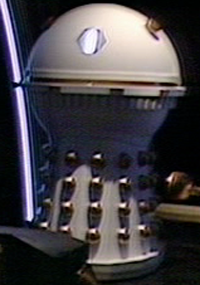 The shoulder section of Dalek N5 also clearly shows a number ‘2’ and even looks like the handwriting matches! The top of the skirt had to be cut away to accommodate the shape of the ‘ball’ section. 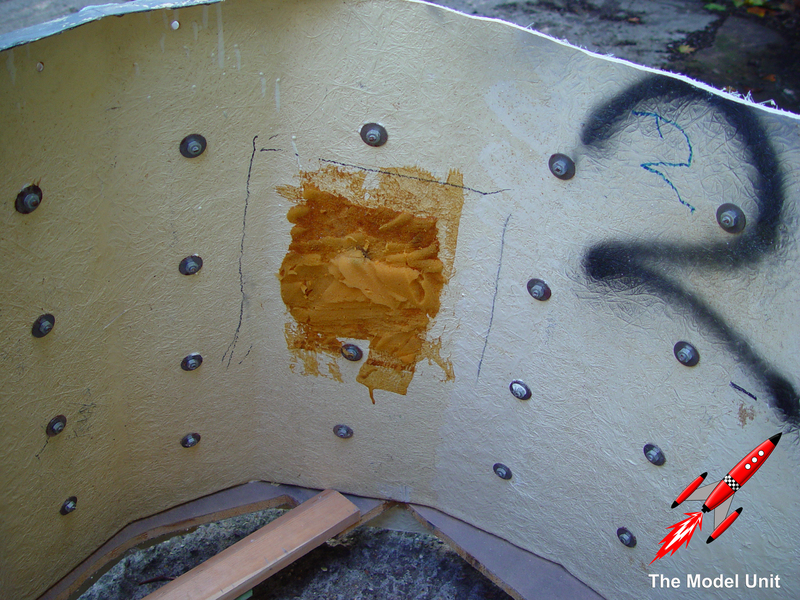 To fix the top to the skirt, bolts were secured through the rear corner panels and through the front two panels. 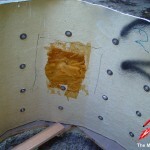 The front holes were covered with two white discs. 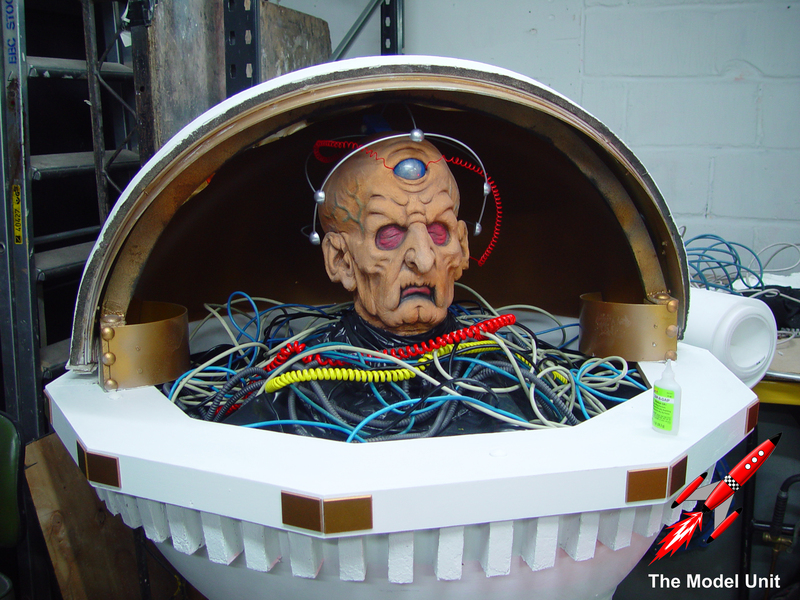 Over 25 years after the prop appeared on screen, the mystery of the purpose of the white discs had been revealed! 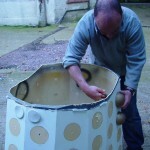 Mike carefully removed the hemispheres to assess the remaining paintwork. The surface of the skirt under the hemispheres showed no sign of its original grey paint indicating that it had been mostly stripped prior to painting white. 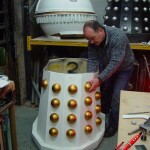 This would have been needed to allow the cleaner and crisp finish that the Imperial Daleks had. 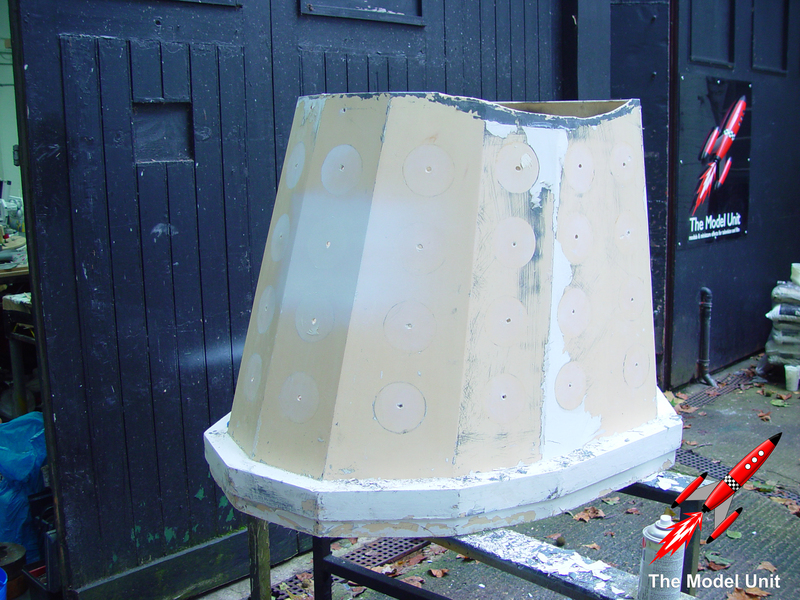 As mentioned previously, some of the original grey paint remained around the very top of the skirt in the area that would be covered by the foam ‘joiner’ between the skirt and top section. 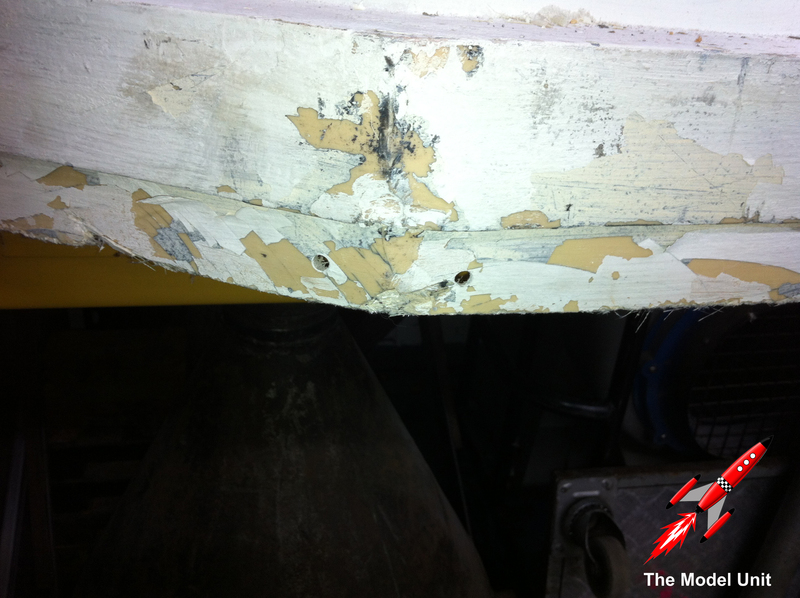 Unfortunately, the remaining paintwork was flaking away very easily, even to the touch. So in the interests of preservation and its ultimate use in exhibitions again, it was decided that gently stripping and repainting would be the best way to go forward. As previously noted, the original hemispheres were in a poor state and so a complete new set were cast. 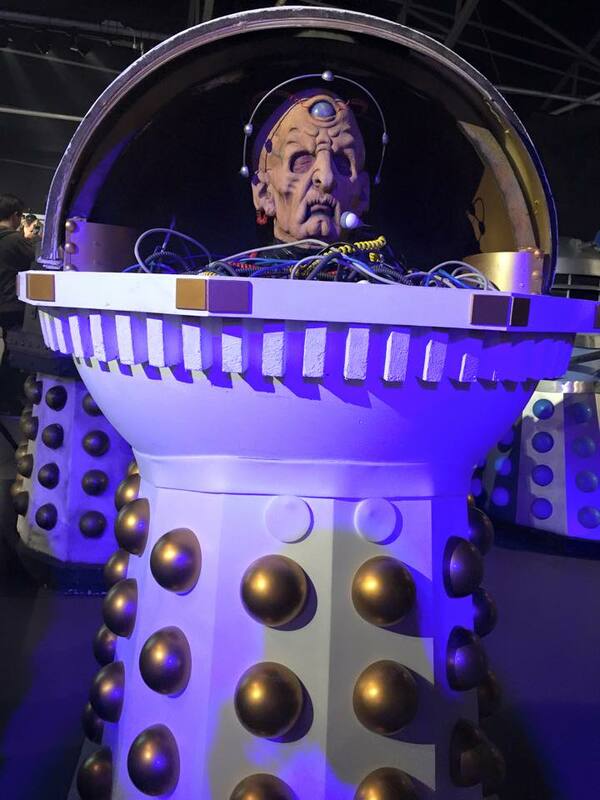 This would have two benefits – the prop would resemble its original screen-used look and, as the hemispheres can be unscrewed, would mean there would be no significant loss if any were removed when in residence the Doctor Who Experience. 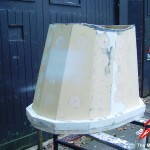 With the skirt section newly painted in pristine white, the hemispheres and top section were fitted back in place. 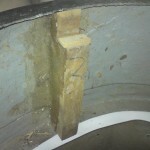 Two new white discs were fitted to cover the front bolts and a new foam joiner was applied around the top of the skirt. Work then began on the upper section. This section had originally been created from a prop leftover from use in another BBC programme called Bodymatters. It had been a large eye with opening eyelids and therefore relatively easy to convert. Compared to the skirt the remaining paintwork was still pretty good and so only required some touching up here and there. New detailing, that matched the original, was fitted back into place around the edge of the circumference and new lights were fitted back onto the sliding section. 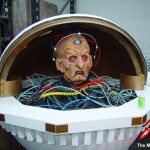 The Model Unit were also proceeding well with their refurbishment of the original Davros chair and because that particular prop was still largely in its 1980s form it was decided to stay with that era of the show for its completion rather than take it back to its 1970s look. 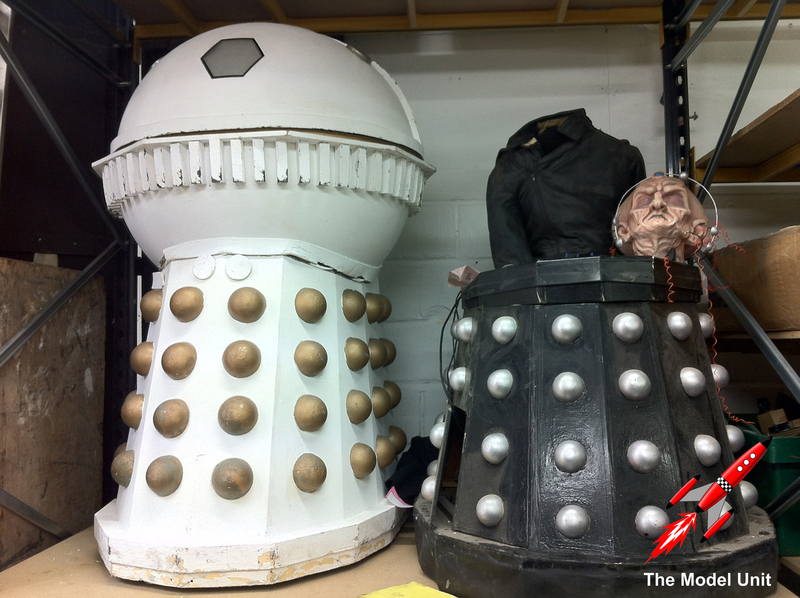 Mike was able to recall where the original ‘Stan Mitchell’ Davros head mould was and after a call to a colleague, it was soon back in his possession. The mask had needed to be completely redesigned for 1984s Resurrection of the Daleks as the original ‘John Friedlander’ version had perished. Fortuitously, the mould was still usable after nearly thirty years and two new heads were able to be pulled from it – one for each prop. One of the heads was fitted into the Emperor prop and a new, replica, neck brace and head set was added. To complete the prop, various wires were draped around the ‘body’ as per the original prop. 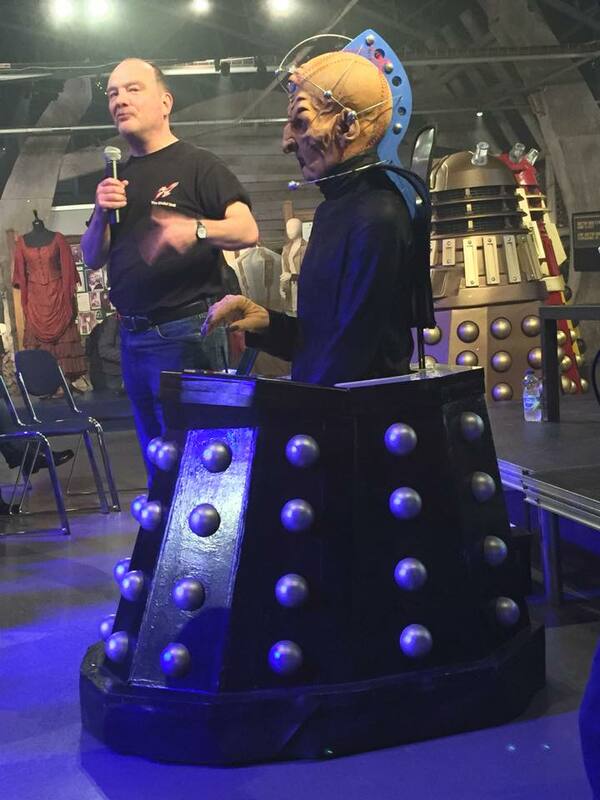 The Emperor was returned and revealed at The Doctor Who Experience special ‘Dalek Day’, along with Davros, on 24th October 2015, where Mike was on hand to deliver a fascinating talk about his and Alan Marshall’s work on the two props. 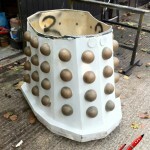 One half of Dalek 63•88, Jon, was lucky enough to be at the event and Mike gave him a brief preview up close of both the props. Jon can confirm that they both look incredible and feels very privileged to have been given an extra special viewing! 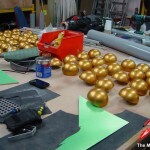 If you would like to see more pictures of the work you can see them here in our Facebook album. 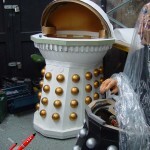 Alan Marshall’s work on the Davros prop can be seen in this album on The Model Unit’s Facebook page. You can also visit their website here and see more of their award winning work. The Doctor Who Experience at Roath Lock closed its doors for the final time on 9th September 2017. The two props are now in storage and at the time of writing there is no news on whether the display will reopen elsewhere. Hopefully it won’t be long before these amazing restorations are back on show! Both Gav and Jon would like to express their immense gratitude to Mike and his team at The Model Unit for allowing us to share this special feature with you.